Just when you thought Seattle couldn’t get any more stunning, we’ve rounded up our favorite, most picturesque places to take it all in. Read on for the best spots to see everything from the signature Seattle skyline to the surrounding mountains and sea. Seattle’s first skyscraper, the Smith Tower has one of the best views in the city. From the 35th floor you can get an up-close-and-personal view of the Seattle skyline. Built in 1914, this Pioneer Square landmark includes an open-air observation deck and the Temperance Café and Bar, a speakeasy-style restaurant that offers small bites, craft cocktails, and a piece of Seattle’s rich history. The Nest, fittingly named, is perched on the 13th floor of the Thompson Seattle, a contemporary boutique hotel. Only a few blocks from Pike Place Market, The Nest offers sweeping views of Elliott Bay, ferry boats, and Seattle's downtown city streets. You can enjoy the view from either the indoor bar or one of the plush fireside couches on the patio. If you’re looking for a postcard-perfect shot of Seattle, head over to the viewpoint at Kerry Park in Seattle’s Queen Anne neighborhood. Great for a romantic date or for watching the 4th of July fireworks, Kerry Park is a top-notch vantage point for catching an unobstructed view of downtown as the city lights sparkle. On the western edge of Ballard, Sunset Park sits above a busy bay, alive with sailboats and ships. All you have to do after finding this hidden gem is sit back, smell the salty sea breeze, and take in the one-of-a-kind sunsets its named after. Take a ride on the West Coast’s tallest ferris wheel, coming in at 175-feet tall, just when you think you’re city can’t look any better. Located on Pier 57 along Seattle’s scenic waterfront, The Great Wheel features 42 enclosed gondolas and is open year-round, ideal for anything from a romantic evening to family fun. For a little bit of exercise to go with your view, head over to Volunteer Park. Built in 1906, the Volunteer Park Water Tower is hard to miss. It sits 75-feet above the highest point on Capitol Hill for a grand total of 520-feet of elevation—that’s the same height as the Space Needle! It’s time to lace up your hiking boots and climb the 107 stairs to the top for a spectacular 360-degree view of Seattle. At 993-feet, the Columbia Tower is the tallest building in the Seattle skyline. It’s so tall it takes two separate sets of elevators to get you to the 73rd floor observatory. But the view’s worth the inconvenience. From the lookout point, you’re met with a breathtaking, 360-degree view of Seattle and local history lessons detailed on the interior walls. There’s no better way to spend a sunny summer afternoon than lounging around Gasworks Park. 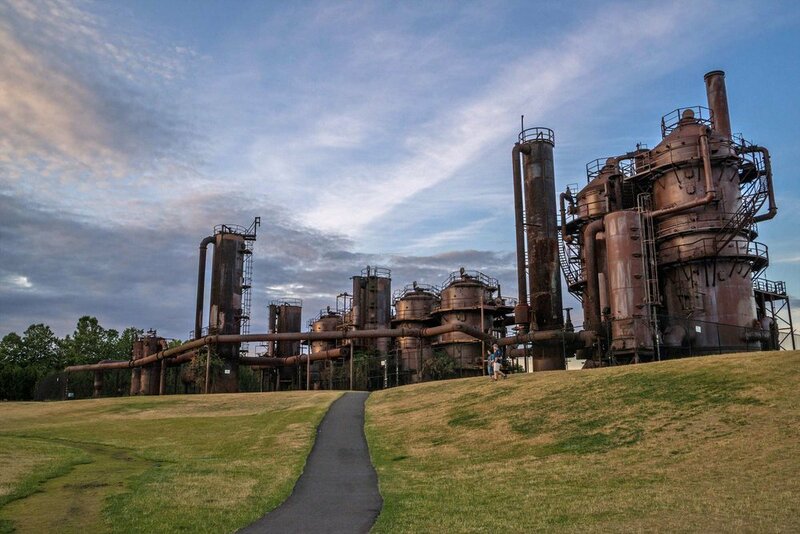 Located on Lake Union across from downtown, Gasworks park offers an unobstructed view of the city. Pack a picnic lunch and get ready to soak up the sun. Mt. Baker Ridge Viewpoint is a park famous for its sweeping views of downtown, Puget Sound, and the Olympics to the west. Constructing the park was a community-driven effort in collaboration with Seattle Parks and Recreation, dedicated in 2009 after 10 years of effort and activism. On the west side of Beacon Hill, Dr. Jose Rizal Park has an amazing view of south Downtown and Elliott Bay. And don’t forget Fido! The park has a dog off-leash area at its north end in addition to picnic tables, restrooms, and a small play area for children. With its panoramic views of Mt. Rainier and downtown Seattle, Ella Bailey Park is now one of the most popular destinations for viewing Fourth of July and New Year's Eve fireworks. Formerly the playground for Magnolia Elementary school, Seattle Parks and Recreation renovated the space into a beautiful community playground meant for everyone to enjoy. Westward is an award-winning full-service restaurant located directly on the north shores of Lake Union. 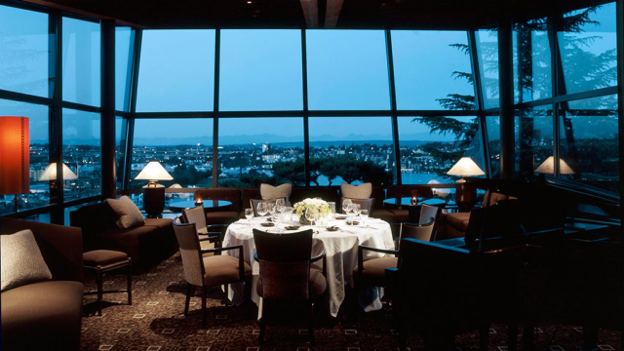 The only thing better than their signature Northwest-inspired fare is that every seat has a unique view of the lake and city skyline. Guests can arrive by boat, kayak, or paddleboard and tie up to the 100-foot dock. Enjoy a meal with a rooftop view, no matter the season, at MBar. Serving up an inventive Middle Eastern-leaning menu with Italian and Spanish accents, full dinner service is available in the glass-walled dining room, while light bites and cocktails are served on the heated, partially-covered patio that offers near-360-degree views of the Queen Anne hills, Lake Union, and beyond. It doesn’t get much better than having a Spanish brunch on Terra Plata’s rooftop garden in Capitol Hill. Driven by an “earth-to-plate” concept, Terra Plata offers delicious plates inspired by the seasons and made possible by our region’s local growers and artisan producers. Every Monday evening is paella night, featuring (surprise) paella, pinxos & tapas, Spanish wine flights, seasonal sangria, and hand-crafted cocktails inspired by Spain—you won’t want to miss it! At Maggie Bluffs they want you to come as you are and enjoy the spectacular view, the outstanding food, and the fun-loving staff. So if you’re by Elliott Bay, catch a meal on their patio that promises a million-dollar view on a ten-dollar budget. The Ballard Elks Lodge #827 sits on the shores of Shilshole Bay overlooking the beautiful Puget Sound and Olympic Mountain Range. All are welcome to drop in for a beer, find out more about the Ballard Elks Lodge, and–of course–to enjoy the incredible view the incredible view. The Fog Room rooftop lounge brings the outdoors in with retractable windows featuring water and skyline views from the 16th floor. Only a block away from Pike Place Market, this eclectic and lively lounge offers authentically Seattle cocktails and small bites. Alki Beach is a Seattle summer staple. The two-mile stretch of land offers a fair number of volleyball courts, ample tidepooling opportunities, a handful of restaurants, bars and cafes, and— of course— stunning views of the city skyline. Seattle’s most iconic landmark is the obvious choice for its 360-degree panoramic view of the city. At 520 feet in the air, the rotating observation deck offers a view of Downtown, Elliott Bay, the Olympic Mountains, Mount Rainier, and much more. Use the Sky Deck’s PanoCam, an interactive log of past photos to see the city’s all-time best views.